If you’re looking for a change of atmosphere, step into Coasters Pub & Biergarten in Melbourne. This iconic pub is tucked away in the corner of a Melbourne beachside strip mall and serves beers from some of the best breweries all around the world (37 taps and over 100 bottles). While beer is the main star, a full bar with wine and liquor is also available for the non-beer lovers. The atmosphere inside follows a traditional European décor with a modern twist. Long wooden bar, wood and stone brick accent, old and new beer artifacts, 13 flat-screen televisions to watch your favorite sports team and dim lighting – all of which present a comfortable environment. Step outside into their Bavarian style biergarten, and if only for the moment, you will feel as if you’re in Germany or Belgium. You are welcome to bring your dogs to the outdoor area, which is an added bonus. Water bowls are also provided and the tables have a tie up hook. Two of my fellow foodie friends joined my wife and I for dinner allowing for a wide variety of menu items to taste. We started off with the table full of appetizers. Our favorite was the truffle parmesan cheese fries, and we could not help dipping into the rich and creamy she-crab soup. We also enjoyed the laugenbrezel (warm salted soft pretzel) served with a jalapeno beer cheese sauce, and reggae shrimp tossed in zesty curry sauce. Coasters is known for their burgers, and the “exotic” burger of the day was a bison burger. Although tempting, I decided to have the Aussie burger and beer-battered onion rings. This burger did not disappoint! 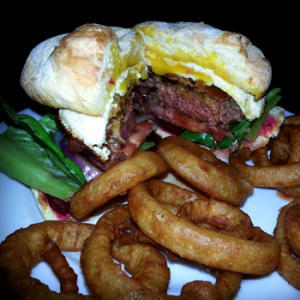 Not only did the kitchen cook the burger to a perfect medium temperature, this was one of those open-mouth-wide burgers stacked beautifully with a fried egg, bacon, red onion, beets, lettuce, tomatoes, in between a toasted Kaiser roll. The subtle sweetness of the beets complemented the saltiness of the bacon. This burger was complemented well with the subtle dark chocolate and coffee tones of the Bell’s Porter draft. I was the envy of the table! Along with the regular menu, Coasters offers specials from the “test kitchen” menu. This menu varies from visit to visit, but during this visit it featured the Sandwich Tour of America, an appetizer, salad, dinner, desserts and a seasonal cocktail called the Stone Fruit Colada. My wife ordered the succulent Carolina barbecue pulled pork sandwich from the “test kitchen” menu, coleslaw and steamed broccoli coupled with a Belgium Kwak ale. Her only response was, “YUM!” I sampled the pork, and it was the melt in your mouth kind that is slow roasted for hours. Our friends gobbled down the signature fish and chips. Half pound haddock filet, beer battered and golden-fried served with a pile of French fries. They washed it down with a refreshing seasonal cocktail and homemade birch beer. Making room for dessert was no problem at all. We decided on the Grand Marnier cake and homemade Key lime pie. 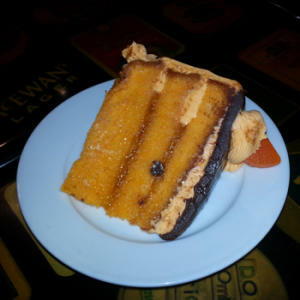 This well portioned triple layered cake infused with Grand Marnier was topped with fudgy chocolate and orange icing. Coasters homemade Key lime pie is made in the traditional style; sweet, tangy, cool and creamy on graham cracker crust with whipped cream. In addition to great food, beer and atmosphere Coasters Pub & Biergarten also offers their annual Belgium Beer Fest in February and Oktoberfest. Both festivals follow their respective traditions with lots of Belgium and German beers and foods. Come in, be festive and enjoy everything Coasters Pub & Biergarten has to offer.